SIS LIVE to build six new SNG uplinks for Sky News. Milton Keynes, March 2014: Satellite connectivity and broadcast expert SIS LIVE (www.sislive.tv) is pleased to announce its agreement with Sky News for the provision of six new Satellite Newsgathering (SNG) vehicles which will deliver HD contribution feeds from breaking news events across the UK. SIS LIVE has been Sky News’ SNG provider for many years offering the technology and expertise required to capture and transmit award-winning news coverage from all over the UK, 24 hours a day. This comprehensive service includes the design, build and maintenance of a dedicated SNG fleet; the provision of satellite capacity and uplink/downlink services; a highly capable team comprising camera operators, satellite engineers and all necessary support functions. The new compact HD trucks, commissioned by Sky News, are designed and built by SIS LIVE’s in-house systems integration team. By ensuring the end to end project, from design of the trucks through to use in the field, is delivered by a single supplier, Sky News can be assured that all systems have been fully tested and optimised by a company that understands the demands that will be placed on them. The six trucks are based on the highly compact Mercedes Benz Vito vehicle and use the very latest satellite technology. 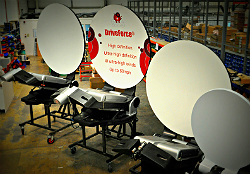 SIS LIVE has designed and manufactured the lightest vehicle mounted satellite system in the world. The DriveForce antenna features the best wind performance on the market and its reduced weight allows for more broadcast equipment to be installed in a smaller 3.2T vehicle. This not only avoids the 56mph speed restriction of the larger vehicles allowing the swiftest response to breaking news stories, but also provides a more comfortable ride for reporters and operators. On board equipment includes HD, SDI, fibre and wireless camera inputs as well as highly specified vision and audio mixers, and the infrastructure for the installation of future IP solutions. The design and careful selection of technology enables a lone operator to manage the whole broadcast and transmission process, including everything from driving to acquisition of the satellite, transmission to camera operation. This is the latest in a series of new developments with major customers which allow SIS LIVE to remain at the forefront of the provision of SNG services to the UK market place.